In this function (x1,y1) is the center of the circle, the distance between (x1,y1) and (x2,y2) is the radius and (x3,y3) is the point to be tested. It is easy to scan all the remaining points in order to find the ones "aligned" on the circle. 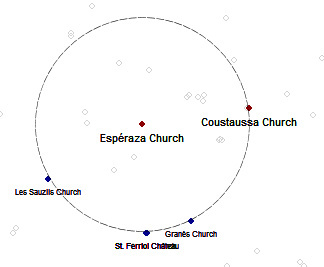 Let's verify if it is correct that Esperaza is the center of a circle passing through Coustaussa, Granès, Saint Ferriol and Les Sauzils, as stated by Henry Lincoln (quoted here). Now you can select two key points you want to analyse, for example Esperaza (Id=35) and Coustaussa (Id=47). 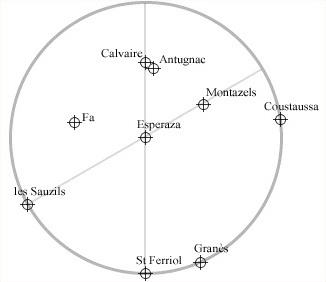 As stated by Henry Lincoln, the alignment of Granès, Saint Ferriol and Les Sauzils on the circle is correct within a tolerance of 50 meters.